Etsy is a fast-growing marketplace that attracts a significant number of merchants worldwide since it’s a perfect place to trial new business ideas. But with the expanding of your business you are starting to experience restriction imposed by this solution. There is a number of reasons that drive retailers to switch from Etsy to Shopify, but main are rising of ongoing expenses, limited branding possibilities and lack of targeted traffic. Why Perform Product Import from Etsy to Shopify? First and foremost the maintenance costs are getting higher and higher with every new product listed or sold. Etsy charges 0.20$ for every product to be added for the period of 4 months to your store and 3.5% transaction fees for each item to be sold. Merchants with a bit higher monthly turnover end up with a considerable sum of money spent on a shop maintenance. Regarding Shopify, it offers several pricing plans starting from 29$ per months. And even with the cheapest one, ‘Shopify Basic’ one can get an unlimited number of products and there is no need to pay transaction fees if native Shopify Payments gateway is used. It is also true that with other external payment gateways no more than 2% is charged on every transaction. It’s obvious that store owners who are aimed at developing their brands will simply lack functionality within marketplace environment. Etsy provides very little control over listings since users are limited to pictures and text to tell about their products. Modifying the overall look of a store as well is a quite challenging task since available customisation tools aren't extensive enough. In its turn, Shopify is a progressive e-Commerce platform that allows building a beautiful and functional stand-alone oіnline store. It is possible to choose from a wide range of templates and massively customize them to create a unique look for a brand. Shopify also provides an opportunity to advance out-of-the-box features with numerous useful apps and extensions in order to act more efficiently on the market. Etsy enjoys a huge established community and capable of securing instant traffic to all the stores on the marketplace. It’s much easier to attract first customers for a newly created brand since Etsy has 24 million buyers. At the same time, such traffic is much less targeted than to independent webshops. It is immensely hard to stand out among thousands of similar stores and grab user's attention. When people visit a specific site, they are likely to get more interested in the items offered there and proceed with the purchase. The key task is to rise a brand awareness and increase an online store exposure to a targeted audience. Shopify provides efficient and progressive tools for reaching this goal. For example, one can drive traffic to a shop and boost sales by running an effective email marketing campaigns, integrating a store with social media, conducting website SEO optimization, etc. E-commerce retailers who have firmly decided on changing their solution are likely to seek help in order to deal with a common issue of Etsy to Shopify product import. There are several ways to transfer data from Etsy to Shopify. Let’s have a more detailed review to define which one is the best. CSV files can be used to import products from Etsy to Shopify platform. From Etsy store admin panel you can choose to export data into a CSV file and save it to a computer, then use this file to import products into a Shopify store. Still, there are some hiccups you are going to encounter with CSV files export. For example, you cannot transfer product variations and there is no other choice, but create them manually again from scratch. Keep also in mind that this file type can only contain text, so it will be a bit troublesome to move images. You need to upload them again to your Shopify store since Etsy CSV file can include image URLs solely. Last, but not the least, your CSV file size can’t exceed the size limit of 15MB. You will simply get an error while trying to import data from it. Thus, if you have a large product listing and a lot of data to move, it will take you quite a while to figure it out. In general, this method is a complicated and time-consuming because it requires a lot of manual work and cannot secure proper data transition. To speed up the process of importing Etsy listings to Shopify you can opt for an app or a script. If you browse through the official shopify marketplace, you will find some good options. However, all of them also work through the intermediacy of CSV files. 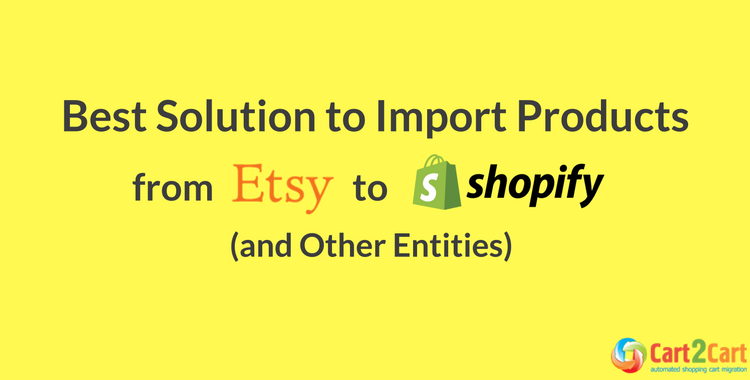 It assists you only in importing Etsy listings to a Shopify store, but you have to perform data export on your own. The main drawback of such solution -- they support solely products migration option in most cases. Pay attention that usage of CSV method imposes strict limitation and a lot of valuable data like images, categories and reviews are not imported because they simply cannot be included in this file format. Still apps of that kind let you move product variants. Another flaw, developers often don’t provide support or it is not reliable and sufficient enough to deal with the frequent rough spots. You also have to watch carefully what apps you are using, since those of a dubious quality are likely to provoke data corruption and poor quality migration. If you want to avoid messing up with incorrect data transfer, it’s highly advisable to choose apps that come from reliable sources. So what the alternative to manual data export with CSV files and limiting apps of disputable quality? Cart2Cart provides you with a highly efficient automated tool to perform Etsy product import to Shopify platform in a secure and fast way. Data is transferred directly to the target store without prior CSV file export; thus various data types can be migrated effortlessly. Cart2Cart service lets you migrate a broad range of entities that previous solutions are simply unable to transfer. Note, there are no data amount limitations and the service works perfectly for small as well as for larger-sized businesses. Cart2Cart also provides the possibility to estimate the cost of future migration for the best convenience. Simply type in the number products, customers and orders you need to move and get the price. One of the main pros of Cart2Cart tool that it is fully automated and minimizes time, financial and human recourses involved while providing a high-quality and secure migration. You have simply to follow a few simple steps to complete it. Launch migration and enjoy the results! If any questions arise at any stage of a migration process, you can always count on 24/7 reliable support team. Our tech engineers will readily provide you with all the necessary details and assistance for smooth and hassle-free migration. Start our absolutely Free Demo Migration that can be conducted only in 30 minutes. It allows you to move a certain number of entities and evaluate all the advantages of Cart2Cart automated migration service.